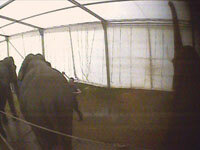 During its 2009 tour, the Great British Circus boasted of its high standards of welfare and showcased the elephants in a (relatively barren) outdoor pen. They even claimed that their circus was operating under the standards of Performing Animal Welfare Standards International (PAWSI), the performing animal industry lobby group that has been advising Defra on industry self-regulation and standards. PAWSI says of itself: “… dedicated to establishing standards to protect the welfare of all animals involved in performance. PAWSI believes that the interaction between animals and man are beneficial to the interests of both, involvement in performance and entertainment is an aspect of this. Our hidden camera revealed that in fact the elephants spent most of their time in a small pen in a tent and every night the animals were chained by a front and a back leg – barely able to take one step back and forwards. Night vision filming showed the elephants able to shuffle a pace forwards or to stand or lie down. Our film shows these chains being removed in the morning and taken away. A year on, and public and political support for a ban on the use of wild animals in circuses has never been stronger. In March 2006 the previous Government made a commitment to the House of Commons and the public to ban wild animals in circuses under the new Animal Welfare Act. This issue, which has such overwhelming public support, was finally reaching resolution in March 2010 just prior to the General Election, after extended consultations, working group and feasibility studies. It would therefore be extremely disappointing after four years of deliberations if the new Government does not seize the opportunity to end this suffering. The failure to establish a ban on animal circuses under the Animal Welfare Act falls on the shoulders of all parties; now is the time to take decisive action to stamp out this barbaric and uncivilized form of entertainment once and for all. Though the new Defra Minister Jim Paice has not yet made any solid commitment on the government’s plans regarding the continued use of wild animals in travelling circuses, the public will be expecting decisive action from the new Conservative / Liberal Democrat Coalition Government on the issue. As governments worldwide consider bans on animal circuses, and as the first animals from the Bolivian circuses take up residence in sanctuaries, many will be hoping that the UK is not left behind in pursuing progressive legislation to protect animals. ADI are calling on their supporters to contact their MP and ask them to sign EDM 403 Wild Animals in Circuses. The House of Commons, London, SW1A 0AA.